As well as know that Mars planet is fourth planet from the sun in our solar system and which is also second smallest planet in our Solar system after the Mercury planet. 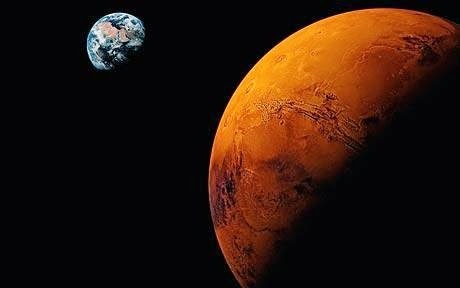 Here this blog is going to write about interesting facts about the Mars Planet which are found by present researches. Mars has tallest volcanic mountain in our Solar System: it is found that Mars planet has one of the tallest mountain which is about 22 kilometer from the surface of the planet and it is named as Olympus Mons. As compare with the Mount Everest it is three times as tall as Mount Everest from the sea level. Olympus Mons is one of the youngest of the large volcanoes on Mars planet which is located at the western hemisphere of the planet at approximately 18.65°N 226.2°E. Largest Dust Storms in the Solar System: Mars has the largest dust storms which can last for months & cover entire the planet. Almost No Atmosphere: it is said that the planet has very thin layer of atmosphere which is similar to no atmosphere. The atmosphere on planet consists of about 95% of carbon dioxide, 3% nitrogen, 1.6% argon and traces amount of water and oxygen. So if we tried to stand on the surface of the Mars planet without any oxygen than we will die immediately. As well as it also has freezing cold temperature. The orbital time period of Mars planet is 687 (Earth Days) which is double the Earth and the solar day is slightly longer than our Earth; it has solar day of 24 hours, 39 minutes, and 35.244 seconds. The Martian year is equal to 1 year 320 days and 18.2 hours as compare with the Earth or we can say the martial year is equal to 1.8809 Earth years. Mars planet is easily seen with our naked eyes from the Earth. The diameter of the planet is approx. half of our earth and less dense than our earth. Due to the high presence of iron (III) oxide which is commonly known as hematite or rust, its appearance is red-orange. Planet is the host to five functioning spacecrafts; they are Mars Odyssey, Mars Express and Mars Reconnaissance Orbiter. These three spacecrafts are present in orbit. And two on the surface of Mars and they are Mars Exploration Rover Opportunity and Mars Science Laboratory Curiosity. The Atmosphere of the planet is composed of 95.97% carbon dioxide, 1.93% argon, 1.89% nitrogen, 0.146% oxygen, 0.0557% carbon monoxide, 210 ppm water vapor, 100 ppm nitric oxide, 15 ppm molecular hydrogen, 2.5 ppm neon, 850 ppb HDO, 300 ppb krypton, 130 ppb formaldehyde, 80 ppb xenon, 18 ppb hydrogen peroxide, 10 ppb methane etc. Minds of entire scientists and astronomers are searching for a clue and presence of life on mars planet. For this purpose number of research have been made on martial surface as well as also tested number of experiments but till the moment non of them have been able to find a single life on mars planet. 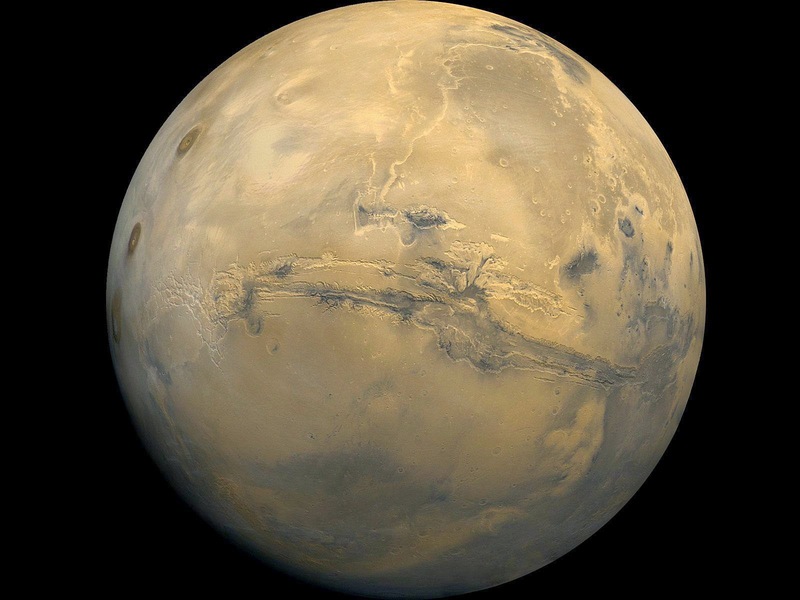 Scientists have provided number of reasons that life once existed on mars planet. Out of number of reasons the orbit of the planet is one cause Mars planet lie within the habitable zone which for the Sun currently extends from just beyond Planet Venus to about semi major axis of Mars Planet. At the time of perihelion, the planet dips inside this reason but the thin atmosphere of the planet prevents the liquid water from existing over the large regions for extended periods. The evidence of past flow of the water shows that the planet is potential for habitability. According to recent new research and evidence it is suggested that any water present on the surface of the Mars planet may have been too salty as well as acidic to support the regular terrestrial life. Due to the different reasons it is stated that once the planet was significantly more habitable than its today. For now the challenges for the mars planet are the lack of magnetosphere and extremely thin atmosphere. Mars planet has few heat transfers across the surface as well as poor insulation against bombardment of the solar wind & lack of sufficient atmospheric pressure to retain water in liquid form. The planet is closely or perhaps totally, geologically dead. As far as all recycling of chemicals and minerals between the surface of the planet and interior of the planet has stopped due to the end of the volcanic activity. And all these evidence suggested that once there was significantly more habitable than its today but still whether living organisms are ever existed or not is still unknown. There was positive result while making research and experiments carried by the Viking probes of the mid 1970s which was designed to detect microorganisms in Martial soil at their respective landing sites, as well as temporary increase of CO2 production on exposure to water and nutrients. But later the sign of life was disputed by scientists. They suggested that all the data from Viking cannot be done in the light of modern knowledge of extremophile forms of life as well as also suggested that Viking tests were not such a sophisticated enough to detect the form of life. The entire test made could have killed (hypothetical) the form of life. The research and test made by the Phoenix Mars lander have shown the presence of very alkaline pH and which contains magnesium, sodium, potassium & chloride. Soil nutrients may be able to help to support the life but the life would still have to be shielded from the strong ultraviolet light. Some interesting shapes have been found in meteorite ALH84001 at the Johnson Space Center Lab which is thought to have originated from the Mars Planet. Some of the scientists also suggested that these geometric shapes could be fossilized microbes extent of Mars before the meteorite was blasted in the space by a meteor strike & sent on 15 million year voyage to the Earth. Exclusively inorganic origins for the shapes have also been proposed. Recently evidence is detected by the Mars orbiters that small quantities of methane & formaldehyde which are both claimed to be possible proof of life, these chemical compounds quickly break down in the atmosphere of mars planet. Alternatively, these compounds may instead be replenished by volcanic or other geological means like serpentinization. 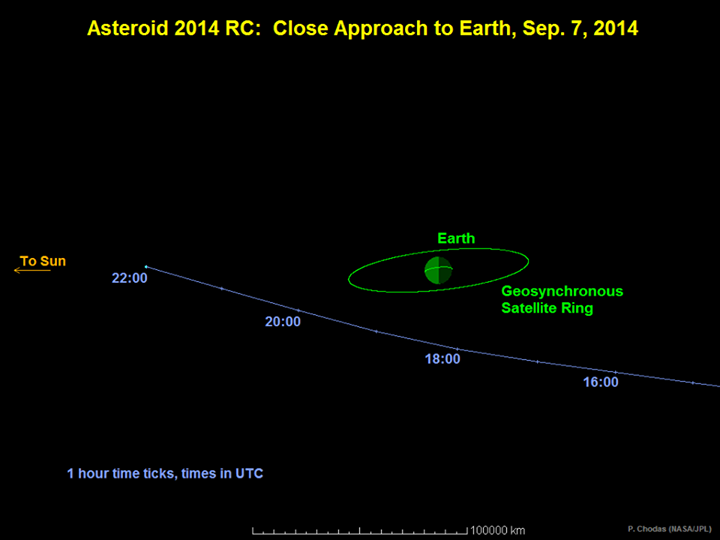 On September 7, 2014, a small asteroid named as 2014 RC will be passing safely very close to Earth. It will be making closest approach on 2:18 pm EDT (11:18 PDT/18:18 UTC) based on current calculations and it will be roughly over New Zealand. According to the estimation of astronomers and its reflected brightness it is estimated that the asteroid is about 60 feet (20 meters) in size. This asteroid was first discovered on the night of 31 August by Catalina Sky Survey near Tucson, Arizona & independently detected the next night by the Pan- STARRS 1 telescope located on the summit of Haleakala on Maui, Hawaii. During the closest approach of asteroid 2.10 RC, approximately it will be on one tenth of the distance from the center of our Earth to moon or we can say about 40,000 kilometers (25,000 miles). The apparent magnitude of the asteroid during this time will be about 11.5, rendering it unobservable to unaided eye but the amateur astronomers with small telescope might sight the fast moving appearance of this near Earth asteroid. It is stated that the 2014 RC asteroid will be passing below the Earth & geosynchronous ring of communication and weather satellites orbiting about 36,000 km (22,000 miles) over the surface of our planet. Though the asteroid is very close to the Earth, it doesn’t create any threat to Earth and satellites but due to its close approach the researchers will have very unique opportunity to observe and learn about the asteroids. While the closest approach of this asteroid will not impact Earth but its orbit will be bringing it back to our planet’s neighborhood in future. The future motion of the asteroid will be closely monitored but no future threatening Earth encounters have been identified.